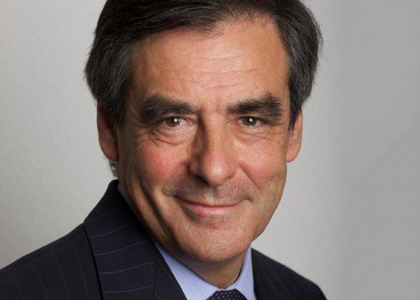 François Charles Armand Fillon is a French lawyer and politician who served as Prime Minister of France from 2007-2012. As a member of the UMP, Fillon became Jean-Pierre Raffarin’s Minister of Labour in 2002 and undertook controversial reforms of the 35-hour working week law and of the French retirement system. He became Minister of National Education in 2004 and proposed the much debated Fillon law on Education. In 2005, Fillon was not included in the new government headed by Dominique de Villepin, but was elected Senator for the Sarthe Département. His role as a political advisor in Nicolas Sarkozy’s successful race for President led to his becoming Prime Minister in 2007. He resigned after Sarkozy’s defeat to François Hollande in the 2012 presidential elections. Aiming to build consensus within a fractious UMP following Francois Hollande’s victory in the French presidential elections in 2012, Fillon declared his candidacy to become the President of the UMP party. On the day of the vote, both Fillon and Jean-François Copé claimed victory and accused the other of cheating. This led to a major political crisis within the party with votes being recounted twice and Jean-François Copé finally being declared winner. Fillon has a reputation as an Anglophile and has had speaking engagements at a wide variety of universities in Britain, notably the London School of Economics. Politics and education are the main topics of his talks. Fillon’s wife, Penelope, was born in Llanover, Wales, the daughter of a solicitor. They met while she was teaching English during her gap year in Le Mans, and they were married in the bride’s family church in June 1980. Having lived all his life in the Le Mans area and represented it politically, Fillon is an enthusiastic supporter of the city’s famous 24 hour sportscar race which he has attended nearly every year since he was a small child. He is on the race’s organisation committee and has competed himself in the Le Mans historic sportscar race.